LL was rocking the salt dough ornaments over the weekend when we went to visit Middle Sister. 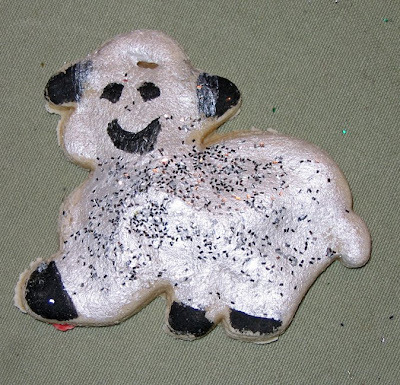 Here is her happy sheep - waiting for a bit of ribbon so he can hang out on the tree! Imagine what kind of yarn he would make - white and shiny! I am crazed trying to finish work and Christmas preparations so not much blogging this week. Happy Holidays to all! 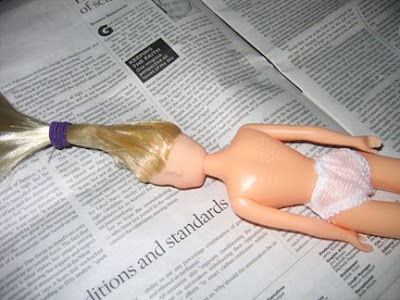 I only wish I could tell you what weirdo project I was working on that required me to give a doll an up-do, but it's a little too soon to share. Sorry about that! But I had a great time playing with dolls and saying it was work. On the sometimes I don't love my job front - this just in. Why is it snowing in Las Vegas you might ask? Well, I will tell you why. It's because THAT'S where the yarn that I have been waiting for for a week went by mistake, and so OF COURSE there is a freak snow storm so that even though the yarn was supposed to be here tomorrow after it's country-wide detour, it might not be, because FedEx couldn't get their planes off the ground, and for all I know still can't. Not that I am bitter. While I was trying really hard not to over schedule on gift knitting this year (for a change), I discovered I didn't like not having ANY Christmas gifts to make. So I did a little stash diving, and a little list searching, and came up with a few things that I would like to make that the recipients would also enjoy receiving. 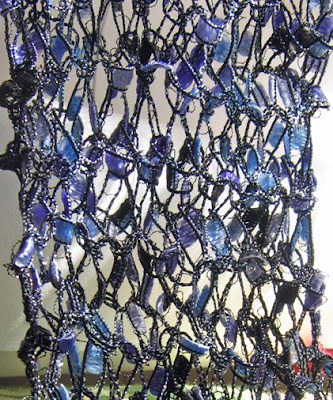 I finished up the Eros Glitz scarf I showed you in a previous post. I wanted to use up the whole skein of yarn, but I got bored and ended it off at about seven feet long! Now I have to put the extra away, which is why I wanted to use the whole skein - I don't want extra! Ah well, boredom won out over clever, as it so often does. Then I started these. I have a friend and neighbor who sincerely enjoys getting handmade gifts, so I love making things for her. 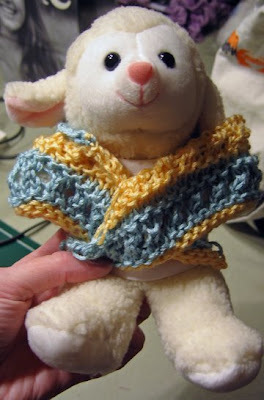 Last year I made her a Calorimetry from Knitty.com and she loved it. 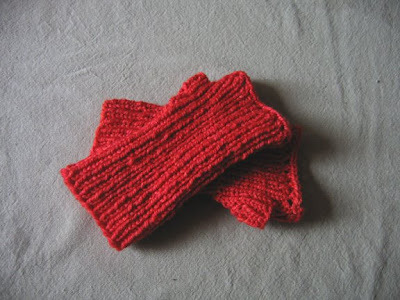 I had enough of the yarn left over (Sheep Shop Sheep 3 in a photos-don't-do-it-justice semi-solid orangey-red) to make these cozy wrist warmers to match. 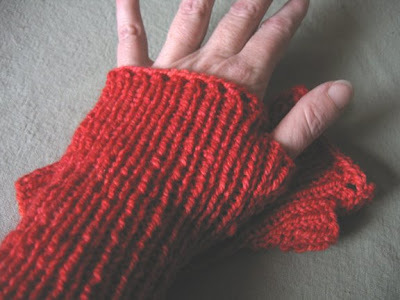 The pattern is from The Purl Bee blog, and they are called the Greenaway Gloves. I may make a pair for LL too - they work up very quickly in sport or DK weight yarn on size 5 needles, and lord knows there is enough yarn around here that I should be able to stash dive for something LL would wear. LL is having her first real "grown-up" Christmas and is not sure how she feels about it. There is a very expensive gift that she wants, and I told her she could have it for Christmas if I didn't buy anything else for her except stocking goodies. On the one hand, she really wants the big gift, on the other, she has always had a million presents under the tree and is not real sure how she would feel about one. After much pondering she decided on the one big gift. I, of course, am scrounging around for coupons and things to make and bargains so that I can have a few small things to wrap without blowing the budget. Sometimes it's hard for us both to grow up! A quick garter stitch scarf for a relative in Georgia - I was aiming for decorative rather than warm, so am knitting up a skein of Plymouth Eros Glitz that I found in the stash. Does anyone else discover yarn in the stash that they have absolutely no memory of acquiring? This is one of those skeins. In other news - did everyone see that madness on Stephen Colbert's site? Knitting Radicals! I also like the comment from the CLF (Crochet Liberation Front) that is currently on the top of the list. And for those of you who aren't Getting Loopy! followers (although you should be!) I have some cruise news. Doris Chan and I will be hosting the first Crochet Cruise to Canada. It leaves NYC on July 4th 2009, more details are to be found at Lace Wings Cruise Check it out and join us if you can! I am off to do more pattern writing. Sigh. That's the boring part so far as I am concerned. This is Figure, who came from the 2008 Oireachtas. She has an O t-shirt on which amuses us all no end. This is LL's third O animal - the predecessors are a wolf named Ceili and a bunny named Solo. What she will name next year's animal when she has no new dances to do I don't know, but we shall cross that bridge when we come to it. 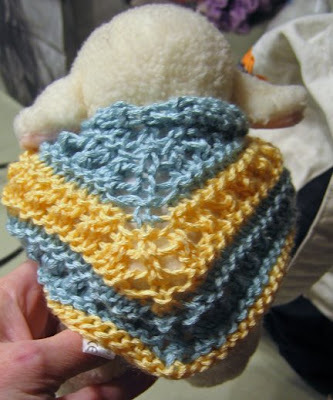 In any case, I have a knitted shawl coming out soon for Caron yarn. It doesn't look a bit like this one in an adult size, but I wanted to check a few of the pattern instructions so I was noodling around with the stitch combo and the shape and this is what came out. It fits Figure perfectly, so I knew it was meant for her. Am I the only crazy that dresses stuffed animals with leftovers? Speaking of shawls, I have a new knitted one and an accompanying article in the January issue of Creative Knitting - if you subscribe, it's the one you just got. It's a silky shawl in SWTC Phoenix, and I quite like it if I do say so myself. The photo was nicely styled as well. Looking at the calendar, thinking about Christmas knitting and crocheting - you would think I would start this process in August, but no. Speed will be the watchword this year. Anyway, I have some pattern writing to do that I have been procrastinating about - off to do it. 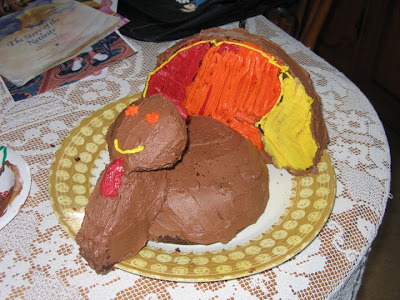 This is LL's pastry masterpiece - a turkey cake! Her 3-year-old cousin was somewhat disappointed with Thanksgiving dinner, because when he was asked what he wanted he replied "turkey cake" and his mother put actual turkey on his plate first. And corn, and mashed potatoes too! He suffered through it though, and got a big slice of turkey tail for dessert. We had a lovely time at the regional Irish dance championships, right up until the second round when LL twisted her sprained ankle again. Needless to say, she did not medal. As disappointing as that is, she has next year and the year after, etc etc etc, to make up for it. She will be taking it easy dance-wise and catching up with her neglected homework for the next month or so, and we can start all over again after the first of the year. Now that I am not driving to dance class 5 days a week I will attempt to get my own neglected homework together - the blog and the Getting Loopy web site. If LL can catch up, so can I!